Jazz Fest promoters announced earlier this week that minor staging changes were being put into place for the first time this year. Those changes include bleachers on the horse track at the back of the Acura Stage and expanded ‘no chairs’ sections at the Acura and Gentilly Stages. 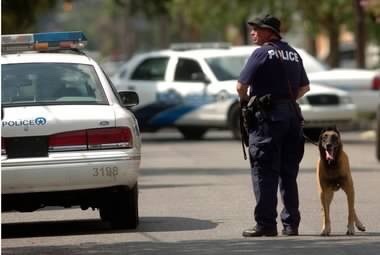 In a surprise move of their own today the New Orleans Police Department’s Chief of Police Michael Harrison announced that the department would be using their K-9 unit to detect drugs being carried in by festival goers. “While the City Council has made moves to decriminalize marijuana possession, it’s still illegal,” said Harrison. Quint Davis, long time Jazz Fest organizer, could not be reached on vacation in Colorado. Fest goers caught attempting to smuggle in alcohol must drink or throw away their liquor before entering the Fairgrounds. However fest goers caught with illegal drugs will be required to pay a $150 dollar fine or share their stash with the headlining act in the Blues Tent. NOLA Native Tours is a New Orleans based co-op of tour guides dedicated to showing the world our favorite city. Where does NOLA come from? Loved by many, and despised by some locals, N.O., LA was a common abbreviation used when sending mail to and around New Orleans. It’s no secret that we’re developing a tour slash game based on the Escape Room phenomenon. For the uninitiated, here’s an NPR piece on them. Escape Rooms have made their way to New Orleans. There are three now and more are in the works. For the uninitiated, an Escape Room is a live action game you play in groups. It’s one part scavenger hunt and one part haunted house. One episode of The Big Bang Theory highlighted the lab of Dr. David Saltzburg, an Escape Room that the characters solved in under six minutes. The three local companies hosting Escape Rooms are Clue Carré, Escape My Room and Mystere Mansion.